Well, this year, I was on the ultimate quest to finally get this soup right because I can’t eat any more pumpkin soup! and I think I might have done just that! I purchased an Heirloom French Pumpkin. 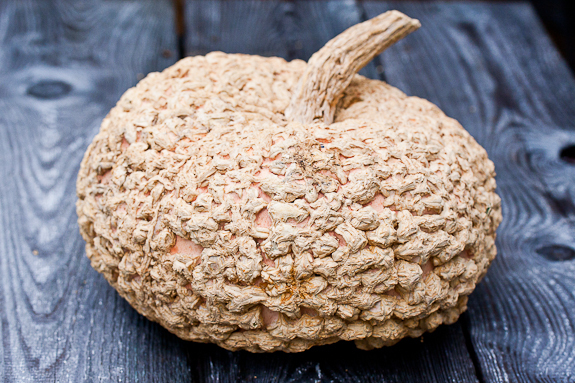 The Cucurbita maxima ‘Brodé Galeux D’Eysines’ – meaning “embroidered with warts from Eysines” (a small city in the southwest of France) is an incredibly unique pumpkin! I think this looks rather spooky, don't you? It’s exterior is a pale salmon-orange skin covered with amazing veins of protruding warts and yields plenty of rich, deep-orange flesh on the inside that is perfect for soups or pie. Of course, in the United States (and for those that do not speak French), we call it a Peanut Pumpkin. Now, why would that surprise you? After purchasing this incredible pumpkin, I then found a recipe on The ex (Expatriate’s) Kitchen blog for Heirloom French Pumpkin Soup. By the way, she also has some great tips on making your own pumpkin puree. We also seem to have the same issues with collecting pumpkins…maybe we should meet! So back to the soup, between the real French pumpkin and a French recipe for the soup…how could I miss?! I must say (and Mr. B and our dinner guests that enjoyed the soup will tell you, too!) 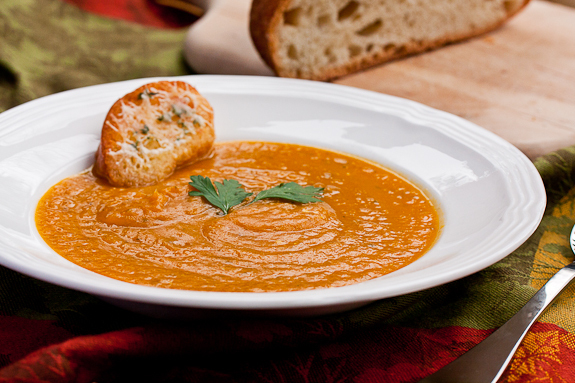 that this soup has a wonderful, rich pumpkin flavor and a complexity from all of the aromatics and chicken stock. I believe that using this funky pumpkin made the difference because Mr. Bunkycooks said this was as close to the soup he had in France that I have made so far (yay!). It is certainly the best tasting and most complex pumpkin soup I have made. Oui Oui! I used my own homemade chicken stock, so I am sure that added to the flavor. We all liked a bit of sea salt to brighten the flavors right at serving. I added French baguette slices toasted with Gruyère cheese for serving. We liked that touch. I also tried a splash of medium dry Sherry in a bowl the next day and would certainly consider that as an option to finish the soup. This recipe makes a large pot of soup, so it will need a good bit of salt and pepper to season it properly, depending on the chicken stock you use. It looks pre-historic? Vous ne pensez pa? I did learn one important tip for purchasing pumpkins. When I cut into the pumpkin, there was a bad spot right around the stem. 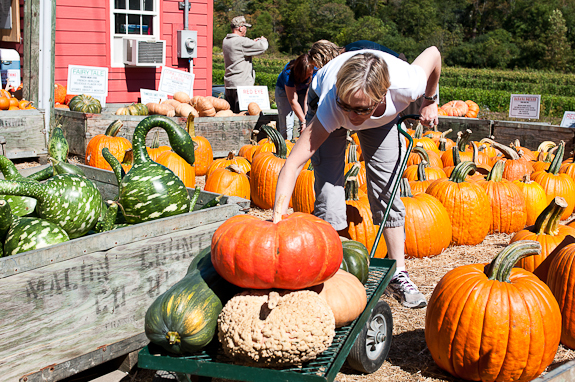 The area smelled strongly of earth and dirt, so be sure to take a whiff around the stems of the pumpkins you purchase. You may look like a bit of a weirdo a bit strange sniffing your pumpkin, but it sure beats getting home and having a rotten (and pricey) pumpkin! Be sure to smell around the stem to avoid this! My ginormous rather large pumpkin weighed about eight pounds, so I guesstimated at about six pounds of pumpkin for the soup. That’s a whole lotta pumpkin chunks! I never thought I would quit chopping. I was terrified a bit apprehensive to try to cut into this pumpkin, considering its outward appearance. It was a pleasant surprise to find out that the shell of this pumpkin is quite simple to cut through with a butcher’s knife. No Samurai pumpkin chopping for this one! This makes the chopping look elegant! 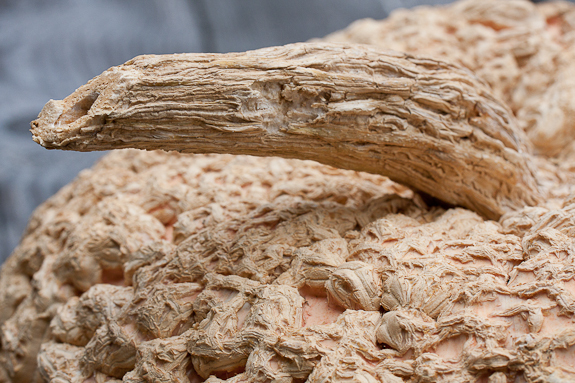 Guess what…there will be a few more recipes with pumpkins coming in the near future. Did you see all of the ones I had in my cart?! Pumpkins will be like peaches…maybe worse! I don’t love them like I do peaches, but there just aren’t many things I can get fresh now that it’s Fall! I just can’t get enough of pumpkins this time of year! This is best served a day or two after you have prepared it to let the flavors come together. First, get a sharp knife. 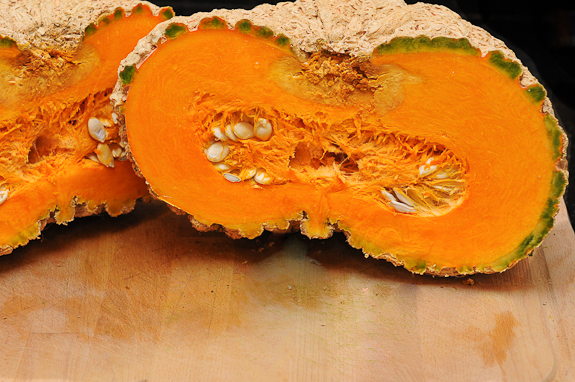 Cut the pumpkin in half, scoop out seeds. Cut the halves into manageable chunks, then cut away the outer rind. Dice the flesh into 1-inch cubes. It’s really not so hard if you have a good chef’s knife. Heat the olive oil in a large stock pot, medium heat. 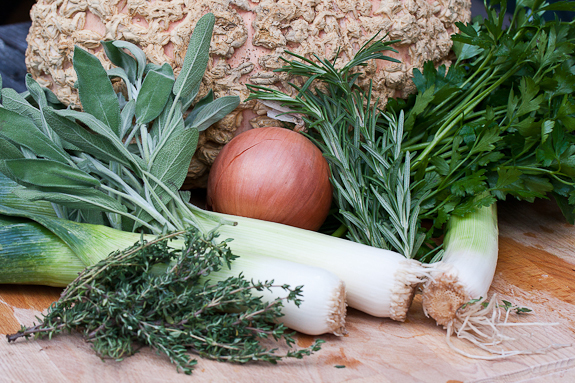 Add the leeks, onion and herbs and sweat the aromatics until translucent, about 10 minutes. Add the pumpkin cubes and the chicken stock and bring to a boil. 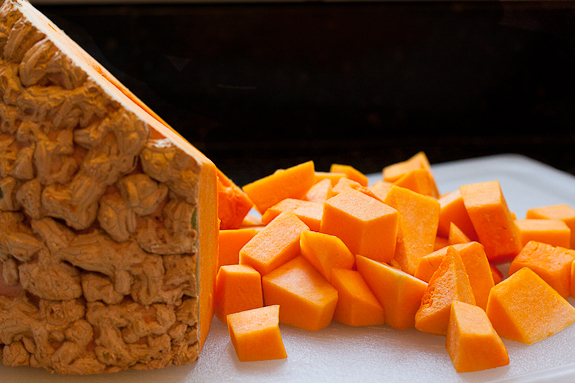 Reduce heat to a simmer, cover and let simmer until the pumpkin is tender, about 20-30 minutes. Puree using an immersion blender (you can also use a food processor or blender, if you puree in batches). Swirl in the butter and the half and half. Add the nutmeg, then taste and adjust the salt and pepper as needed. Use the sugar if you like a slight sweetness to your soups. * My soup was better the next day and even better the following day. Prior to serving, preheat oven to 350 degrees. Butter the baguette slices lightly with butter. Toast on one slide until lightly brown, just a few minutes. turn over and toast for another minute or two. Remove slices from oven and top with a little sprinkle each of chopped fresh Thyme and grated cheese. Put back in oven and toast another few minutes until cheese has melted. Top warm bowls of soup with toasted baguette slices.